« MISFITS – Latest News On Horror Punk Legends! Happy METAL New Year From Metal Odyssey! 2011 is HERE! Metal Odyssey wants to extend a very LOUD: Happy METAL New Year to ALL! A very special THANK YOU goes out to each and every visitor to Metal Odyssey this past year… without the fans of the Metal and music that is covered here, it would not be the same. THANK YOU to all the regular visitors and subscribers to Metal Odyssey… your comments are extremely appreciated! Another very special THANK YOU goes out to ALL the bands and musicians that are covered here on Metal Odyssey, without them, there is no Metal Odyssey! Every band that I interviewed this past year gets a horns up and a THANK YOU as well! Below is a Thank You list going out to those who made 2010 very memorable, insightful and helpful for me and Metal Odyssey… um, THANK YOU! To my beautiful wife for her graphics and technical support, not to mention ALL of her support for everything! To my twin daughters for listening to all the Metal in the house and giving their Metal two cents about what they hear! Yes girls, KISS was around when daddy was a little boy. To Rob Rockitt at HARD ROCK HIDEOUT for allowing me to interview more Rock ‘N’ Roll stars than I could ever imagine! Whoa… HELL YEAH! Metal be thy name. To Best Metal Buddy Scott Coverdale, his Hard Rock and Metal research sometimes amazes me… and really plays a key Metal role in getting a story or review straight! To Greg Hampton of The New Czars, who allowed Metal Odyssey the privilege of “World Premiering” his cover song of the Jimi Hendrix classic – Hey Joe. It was a true Metal honor, Greg, you’re a class act. Check it out: World EXCLUSIVE Premiere – The Jimi Hendrix Experience “HEY JOE” Is Covered By THE NEW CZARS! LISTEN HERE FIRST! To Kev Moore of BC Sweet and Christie, who is a Rockin’ gentleman and class act of Rock ‘N’ Roll! To Eski of Morphine Killer, his post contributions to Metal Odyssey this past year are immensely appreciated! To IRON MAIDEN for still creating METAL! 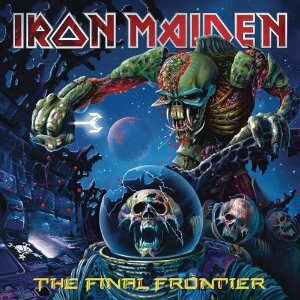 The Final Frontier is Metal Odyssey’s #1 Album Cover Art Of 2010! To the SCORPIONS for giving me a lifetime of music that I’ll cherish forever. To OVERKILL for the unbelievable consistency of unreal-great Thrash over the decades. To DORO, the “Queen Of Heavy Metal”. To Morgan Lander of KITTIE, the “Queen Of Extreme Metal”. To Metal Mark Heavy Metal Time Machine at and Kinger at Demolish Fanzine – 1980’s Heavy Metal Revival. Their correspondence is Metal appreciated! To Ryo Vie at The Rock and Roll Guru, um, sudden U-turns are… METAL. To Sean over at THE METAL FILES, THANK YOU for writing the best damn “personal account” stories of concerts, life as a Metalhead and Rock ‘N’ Roll! Now… keep those forks away from your eyeballs! To Steve at Heavy Metal Addiction for rallying a bunch of us Hard Rock and Metal lovin’ dudes to post our “Best Of” lists throughout the holiday season! To Brian Basher at hardrocknights.com, keep Rockin’ Metal Buddy! To all the PR and record companies that put their trust in what Metal Odyssey had to say this past year… you guys ROCK! No, you guys F’N ROCK! To all the up and coming bands that find me and seek out my opinion on their music… horns up to all of you Metal Muthas! To my Metal Buddies at the South Mall f.y.e. – your all the best! To All fellow Rock, Hard Rock and Metal bloggers, you all keep the Rock ‘N’ Roll flame burning! ROCK STEADY to all of you! To all those I may have missed… I didn’t miss thanking you after all: THANK YOU! BRING ON 2011 AND… LET THERE BE ROCK! METAL ODYSSEY IS REVVED UP AND METAL READY! This entry was posted on January 1, 2011 at 12:13 am and is filed under Hard Rock, Heavy Metal, holidays, metal music, metal odyssey, Music, rock and roll, rock music, rock music news with tags greg hampton, happy new year 2011, hard rock music, Heavy Metal, Iron Maiden, metal music, metal odyssey, rock music news, Scorpions. You can follow any responses to this entry through the RSS 2.0 feed. You can leave a response, or trackback from your own site.